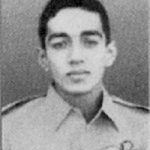 Flight Lieutenant Vijay Kumar Wahi was born on September 17, 1945 in Montgomery district of former Punjab province of British India, now in Pakistan. He was son of Major J L Wahi who was working in Royal Indian army. He was commissioned on 13 March 1966 in IAF and was Serving in 101 Squadron of IAF. He was part of operation Cactus Lilly . Operation cactus Lilly was a military operation undertaken between 3-16 December 1971 by the Indian Air Force (IAF) in the East Pakistan (current Bangladesh). Flight Lieutenant Vijay Kumar Wahi was a pilot in a Fighter-Bomber Squadron. On the 6th December, 1971, he was detailed as number two in an Air to Ground mission to strike the Pakistani airbase at Rafiqui. The target was heavily defended by anti aircraft guns and enemy aircraft but the destruction of this target was of vital importance to our ground forces which were under heavy pressure. He pressed home the attacks and knocked out two enemy tanks. However, his Sukhoi-7 (B-868) failed to return from the mission of attacking ground targets in West Pakistan. He was presumably shot down by F-86 Sabres and ejected sustaining fatal injuries. Flight Lieutenant Vijay Kumar Wahi made supreme sacrifice at a very young age in the line of duty. 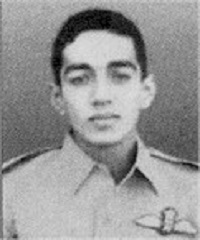 During the operations against Pakistan in December, 1971, Flight Lieutenant Vijay Kumar Wahi was a pilot in a Fighter-Bomber Squadron. On the 6th December, 1971, he was detailed as number two in an Air to Ground mission to Chhamb area. The target was heavily defended by anti aircraft guns and enemy aircraft but the destruction of this target was of vital important to our ground forces which were under heavy pressure. He pressed home the attacks and knocked out two enemy tanks. While returning from the mission, his aircraft was hit and he ejected sustaining fatal injuries.